Early in this foray into blogging, I wrote a post about collective memory – those moments in time when most people remember where they were and what they were doing when events happened. The attack on Pearl Harbor. The assassination of John F. Kennedy. The explosion of the Challenger. All of these are examples of moments of collective memory in American history. 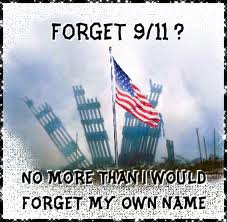 Obviously, today marks the anniversary of another time most people remember – the attacks on 9/11. We all have memories, but it is difficult to hold on to them. Over time, we hear other people talk about their memories. We watch television reports over and over. Before we know it, that information gets combined with information we already have. For historians, memory is a tricky aspect of research. Obviously, it is important to hear the stories of people who took part in an event. However, those stories should be told as soon as possible because none of us are immune to hindsight. I know where I was when the attacks on the World Trade Center took place. I was in my first semester of teaching, and, as the new kid on the block, I was volunteered to teach an off campus class. This meant getting up super early and driving to a police station in Nashville. There I would teach government employees who were working on their degrees. On September 11, 2001, I was showing a video about Hernan Cortez conquering the Aztec. At some point during the movie, there was activity in the hallway, and one of the students, an employee of the FBI, kept checking his pager. Other than that, I sensed nothing going on. When class was over, I walked through the hallway and passed an office with a television. It showed one of the towers with smoke coming out of it. I watched for a while before getting in my car and driving to school. I turned on the radio and called my girlfriend to see if she had heard. But, the call really wasn’t about what was happening in New York. She had broken up with me, and I was looking for any excuse to call her. I don’t remember much about the conversation, but I know it was one of the last conversations we had. This is where my memory begins to fade. On that day, I knew that I would not forget anything that was going on, but that didn’t happen. As time passes some details begin to alter themselves. Did I call my parents to see if they were watching? I’m not sure. What did I do when I got to campus? I’m not sure about that, either. I know that classes were cancelled not long after I arrived, and most people were watching television in the student lounge. Was I watching television in the lounge when the second plane hit, or did that happen while I was in the car? Did I watch as the towers fell? I honestly can’t tell you. I have seen those images so many times that it all gets jumbled up in my mind. I am a historian, and this was a historic event. As it was all happening, I made a mental note to keep these moments clearly in my brain, but that hasn’t happened. I remember how I felt, but the details are slowly escaping me. As a historian, I know that memoirs and interviews need to be studied carefully. As a person who experienced 9/11, it is difficult for me to explain to people that their memories may not be as accurate as they think. I’m not saying that memories are invalid. I’m saying that memories evolve through the years. All of that was rambling, and I am not sure where I was headed when this post began. Posts about 9/11 will be all over the internet, and this is just one by a person who was in the middle of Tennessee when it happened. My memories aren’t important in the scope of that huge event. They are one part of a huge collection of memories – a collection that is changing all of the time. ahh you sneak a post about tomorrow here today, talking about the unreliability of memories…. Very true. My blog clock is off-line, and, according that clock, the 11th has already arrived. I figured that I could slip it in without notice. You were too smart and caught me. Now i have to write something about 911 that is better than yours. hard task. Hey, you know the history of the American West. I like that. Whatever you write, I know it’ll be better than mine. Thanks. I have always found collective memory and the events that cause it interesting. What are you researching? I remember certain things very vividly. Most of which I wish I could forget. Maybe that’s why certain things have blurred. I’ve tried to block it out. Your post inspired me. Thank you. I never thought about collective memory in such a way. You are right in that, our hindsight can get in the way of our memories. Or maybe it’s our sub conscience helping our conscience minds deal with something nearly incomprehensible. Some thoughts to ponder, either way, I loved your post! Thanks for commenting. I’m glad you liked the post. It was a terrible day for everyone. We just had an interesting discussion about it in class. Thanks. I’ve often wondered how people reacted in other parts of the world and if they have vivid memories as people here do. I just remember the hideous unreality of it and then the horrible reality. To this day it is hard to understand why anyone would want to do that to innocent people. And die doing it. Interesting way to look at it. I suppose I never thought about what I actually remember and what I’ve seen since. However, I don’t think anyone’s memories are unimportant, they help shape who we are. And regardless of how close or far away from NYC, I think we all changed just a little that day. Thank you for commenting. Memories are always important because they make us who we are. Just as we change throughout our lives, our memories change as well. There is no doubt that our world has not been the same since that day.